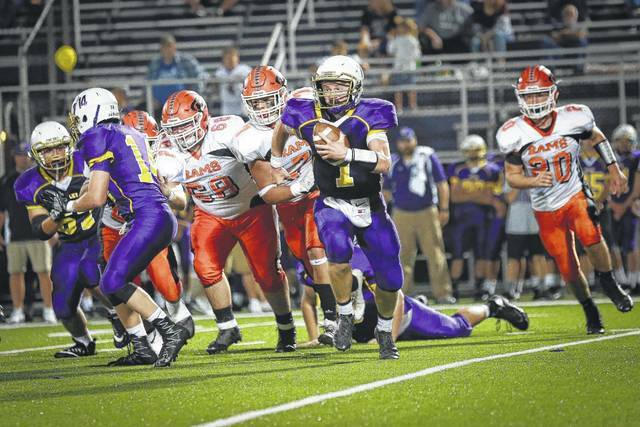 Valley’s Andrew Shope runs the ball against Raceland back on Sept. 16. Over the course of the 2017 season, Valley’s Gabe Streeter has proven to be one of the most explosive athletes in all of Southern Ohio. On Friday evening, the junior all-purpose standout showed those outstanding qualities in spades against Fairview (Ky.) en route to putting up arguably the best performance of his career. Streeter caught a 21-yard touchdown pass, scored on touchdown runs from nine and two yards out, and even added a 33-yard interception return to boot as the Indians rolled over Fairview (Ky.), 40-6, in a nonconference bout that was played in Westwood. From the get go, the Indians showed their strength and poise against the Eagles behind the play of Streeter, who simply refused to be denied over the course of the evening. The senior caught a 21-yard touchdown pass from Andrew Shope on the opening drive of the affair to put Valley ahead by a 7-0 tally with 9:12 to play in the opening quarter, then added a two-yard touchdown run with 2:46 to play in the first half to put the Indians up by a 14-0 tally. However, Valley wasn’t done capitalizing. On the ensuing kickoff, the Indians forced and pounced on a fumble, which proved to be a critical turnover that Valley wasted no time turning into points. The Indians’ Kayden Mollette eventually scored from 11 yards out to put Valley up by a 21-0 tally with just 85 seconds until the intermission, a gap that held until halftime. In the second half, Streeter continued to ball out. After picking off a Turner King pass and returning the interception 35 yards for a score, the upperclassman — who ran for an efficient 85 yards and two touchdowns on eight carries — scored his second touchdown of the third quarter with 19 seconds remaining as the junior answered a four-yard touchdown run from Fairview’s Mark Ekers with a nine-yard touchdown scamper of his own. Huntler Montler finished off the game’s scoring by plowing ahead for a one-yard touchdown run with 2:05 remaining to set the final score. In addition to Streeter’s 85 yards on the ground and 23 yards receiving, Mollette added a standout performance of his own by rushing for 84 yards and a touchdown en route to averaging exactly seven yards a pop as the pair helped Valley average 5.8 yards a carry for the evening (41 rushes for 237 yards). Mollette, a sophomore, also added a team-high 45 yards receiving on three catches, while Tanner Cunningham and Tyler Mitchell combined for 22 yards receiving on three additional receptions. Andrew Shope, who dispersed the ball around nicely, put together a solid outing by completing eight of his 13 passes for 89 yards and the early 21-yard touchdown pass to Streeter to start the scoring. Defensively, Cody Spence led the way as the junior collected a dozen tackles on the evening. Tucker Williams’ nine stops, Streeter’s eight tackles and an interception, and Tre’ Bratchett’s seven wrap-ups led the Indians, who improved to 2-3 on the year. With the victory, Valley will carry a good amount of momentum into its opening SOC II affair, which will be a road matchup against Waverly that will start at 7:30 p.m.